Yet another team will make a playoff push without a key player, as the Detroit Red Wings announced that defenceman Niklas Kronwall will be on the shelf for one to three weeks with a slight knee sprain. The blueliner sustained the injury on Saturday night as his team faced off against the New York Rangers. The Red Wings won the game by a final score of 3-2, but Kronwall got his right leg stuck and twisted in an awkward fall. Kronwall has already missed games for Detroit this season, with a 15-game stretch in January and February thanks to knee surgery. 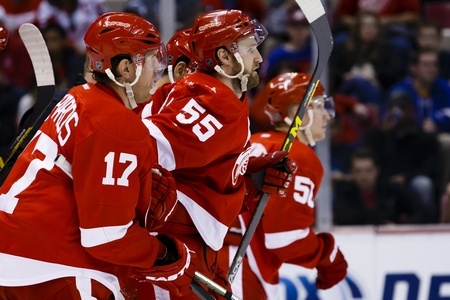 In 53 games this season, Kronwall has three goals and 17 helpers. Ahead of Sunday’s contest against the Toronto Maple Leafs, the Red Wings are fourth in the Atlantic Division with a 34-23-11 record. They have 79 points, good for one of the two Eastern Conference wild card spots. But they’ve had to come from behind to win as of late and that hasn’t put Detroit in a confident position. The injury to Kronwall compounds the problem. Reserve defenceman Alexey Marchenko is on deck for Sunday’s game, but the Red Wings will call someone up on Monday to fill the gap for the next few weeks. Among the possibilities is Xavier Ouellet, who saw five games with the big club this season and seems a shoe-in for next season’s Red Wings. Robbie Russo and Nick Jensen will also be considered, reports say.